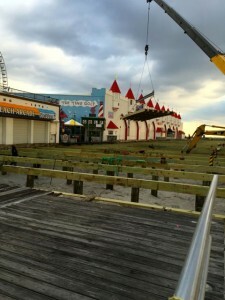 As it has for the past two years, the Ocean City Boardwalk will be split in two starting next week. The third phase of a multi-year Ocean City Boardwalk reconstruction project will begin immediately after Columbus Day Weekend, Ocean City Finance Director Frank Donato reported at a business summit on Tuesday. The work will replace the entire substructure and decking of the boardwalk between Plaza Place (just north of Seventh Street) and Eighth Street. Work in the off-season of 2014-15 extended from Sixth Street to Plaza Place and took about four months to complete. Pedestrians and cyclists likely will be detoured off the Boardwalk at Eighth Street, down to Atlantic Avenue, and back Sixth Street. The detour will add about 0.41 miles to a run the length of the boardwalk (from 2.45 miles to 2.86 miles). Runners could also venture onto the soft sand to cut the distance. But the pine that will be used is thicker (three inches) and sturdier that the pine used on other sections of the boardwalk, and the recently completed sections of new boardwalk have held up well. In a separate update, Ocean City officials have participated in a pre-construction meeting, and work on a federal Army Corps of Engineers beach renourishment project between Seaspray Road and 14th Street or 15th Street is tentatively scheduled to begin at the end of October. Sign up for free breaking news alerts and daily updates on Ocean City news.